As they look at the world around them, young children begin to recognize letters, numbers, shapes, and colors. Every issue of Ranger Rick Jr. has many ways for you to help your child learn these important concepts. 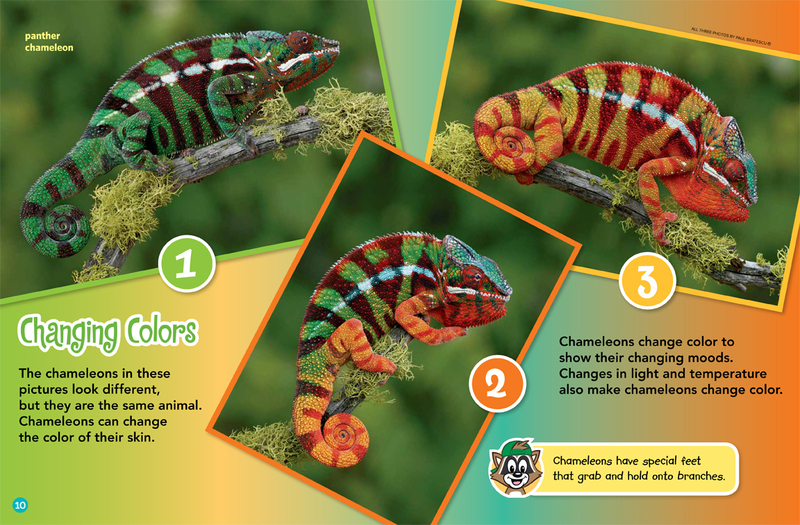 This month you can talk about colors while reading about chameleons on pages 6–11. 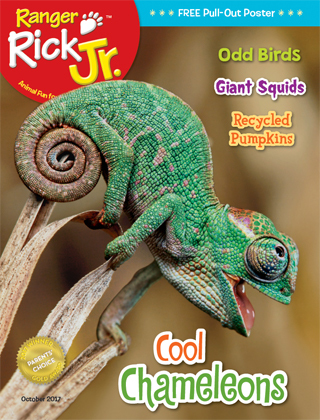 Ask your child to name the colors on the chameleon shown on the magazine’s cover. If he needs help, point to the animal’s green skin, pink tongue, and the white stripe behind its eye. On page 6, you can point to the purple skin on the Pinocchio chameleon and ask your child to find other purple things in the magazine. Then your child can show you a color and ask you to find other examples of that color. After playing the “Find the Color” game, explain to your child that the three panther chameleons pictured on pages 10-11 are the same animal. The chameleon has changed its skin color. The animal may be a different color because its mood has changed. Ask your child if it would be a fun if people changed color when they became happy, sad, or mad. As your read other pages in the magazine, create games based on finding letters, numbers, and shapes. When your child asks you questions, he or she becomes more interested in reading. Enjoy reading Ranger Rick Jr. and playing games with your child.